Was reading at another site that Horizon cars in California are coming to Illinois for the newly-funded trains. Anybody know the start date for these new trains? Accoring to this link, the new amtrak illinois service will start on October 1st. Something tells me that the horizon cars that are used on some of the Pacific Surfliner trains will be moved to Chi-town for the expanded service. They gonna try to out do Metra?? Hope they get some of the refurbished Horizons for these services. I for one hate the Horizon cars. I'll take an Amfleet any day. I think one of the reasons the Downeaster in Maine is successful is b/c of the comfortable equipment (ex-Amfleet Metroliner equipment). Sure hope Illinois gets a fare share. Can someone point me to where I can find the schedule for these new services or at least tell me when it will be available? Amtrak has not announced a name or schedule for this train yet. I'm not sure about the Springfield or Quincy service, but I have an idea about the Carbondale trains. Possible times for the northbound have it leaving Carbondale in the early morning and arriving in Chicago in the early afternoon. 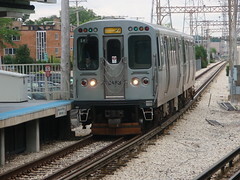 The southbound would leave Chicago in the early morining and arrive in Carbondale in the early afternoon. Both trains would need to arrive at their destinations early enough to make the turn for the trip back that departs at 4 05pm. Currently, most of the Illinois supported trains run with 3 or 4 horizons and a amfleet cafe. I've never had a problem with the Horizons, they're not as comfortable as a 60 seat amfleet coach, but they don't need to be. Most of these passengers are on these trains for less then 5 hours. If you search Yahoo news for some combination of zephyr, amtrak, macomb, october and schedule, you'll find that the Macomb newspaper on Aug. 23rd published a tentative schedule that it got from Amtrak. However, the link now requires a $5 archive fee. I should have posted it when I found it. At any rate, it seems that Amtrak does have a tentative schedule for the new train to Quincy (via Macomb), and that it will start at the end of October (not the beginning). I would assume the other schedules are available as well. I've been surprised that the two Illinois High Speed Rail advocate blogs have not been updating this story. Seems like it would help stir interest and ridership to keep the story fresh. Could it be that less than 60 days out, the plan isn't finalized? In Quincy, they're paving 13 more parking spaces at the depot in anticipation of the second daily run, which the Quincy Whig says will start "sometime in November." They also say that Amtrak spokesman Magliari, who is apparently from Quincy, hopes to announce the exact times of the second run somtime this week. Here is Associated Press coverage of a "pow-wow' between Mr. Kummant and Sen. Durbin (D-IL). To me, a URL link is simply saying "hey, here is where to find it" or analagous to the card catalog (well nowadays the computer terminal) at your local or college library, but reading material located with a URL link does not to me constitute redistribution. I hope it doesn't to the Associated Press. If they're going to involve Amtrak, doesn't it make more sense to do it for a project where the state wouldn't have control, like full, interstate restoration of the Black Hawk to Dubuque? And is the IC line between Rockford and Chicago even still there? To Mr. Norman: That's just scare tactics from the newspaper, just like the ones from Major League Baseball that say you can't describe the game. They can't reserve every right, just the ones that the government lets them reserve. Fair use, including linking and even reasonable excerpting is fine under 17 USC § 107, which exists to prevent exercise of the Copyright Clause from being blocked by the First Amendment.